Many women find that they are affronted with a migraine or headache during times of stress and anxiety. This is a natural way in which the body responds to your emotions, which can be particularly difficult because sometimes the pain in itself causes more stress. Stress headaches are a very common complaint, which - while unfortunate - does mean there is an abundance of research regarding the causes and treatments of the condition. When faced with stress, most women will inadvertently tense their muscles - including those at the back of the neck and sometimes around the jaw. The pressure of these clenched muscles can lead to tension and consequently a headache. Also, when suffering with anxiety it often affects your sleep, and lack of sleep is another cause of headaches. Breathing techniques. Whether this be inhaling and exhaling while counting slowly, or merely becoming more aware of your breath, these techniques can often provide a fast state of calm. Yoga or meditation. Many women benefit from regularly practicing yoga, or taking time to meditate each day. Depending on your receptiveness this can have different effects, but both have long been valued for inducing relaxation. Methodical thinking. It can be useful to try to take a step back from your problems, and address them separately and clearly. Writing a list and examining each one and its potential solutions is helpful for some women. 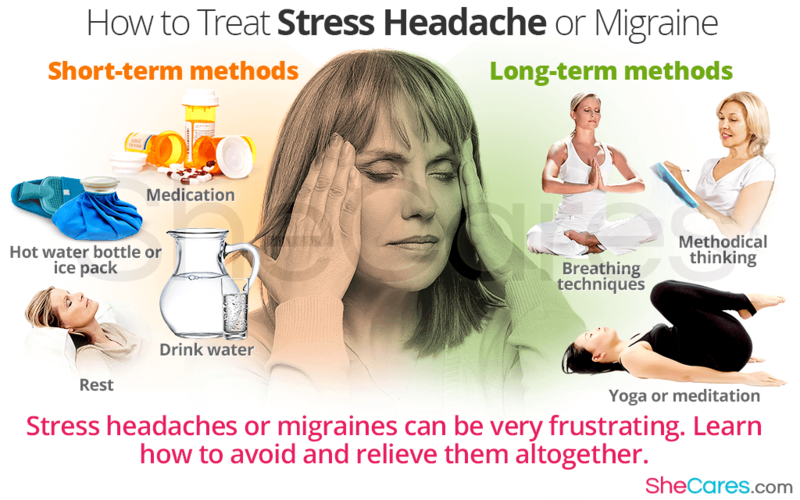 Stress headaches and migraines can be very frustrating, particularly if they inhibit you in your day to day life. Armed with some information, and a willingness to become substantially self-aware, it can be possible to learn how to relieve stress headaches, if not avoid them altogether.